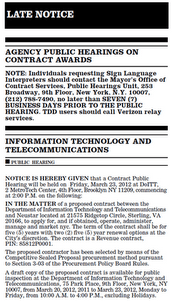 A public hearing on NYC’s allocation of the .nyc contract to Neustar was held on Friday March 23 2012, in Brooklyn. In the matter of a proposed contract between the Department of Information Technology and Telecommunications and Neustar located at 21575 Ridgetop Circle, Sterling, VA 20166, to apply for, and if obtained, operate, administer, manage and market nyc. The term of the contract shall be for five (5) years with two (2) five (5) year renewal options at the City’s discretion. The contract is a Revenue contract, PIN: 85812P0001. 5/8/2010 ISOC-NY EVENT: dot nyc – How are we doing? Tom Lowenhaupt of ConnectingNYC in a post DoITT: Submit Application THEN Ask Public In response reports that, at a recent press conference and in response to his questioning, NYC Department of Information Technology and Telecommunications (DoITT) Commissioner Carole Wallace Post confirmed the City’s intention to file an application for a .nyc generic top level domain (gTLD) within the current window, which ends April 12. What is New gTLDs Program? Please note that this will take place Tuesday evening New York time. iBreakfast is presenting “About the “Domain” Conference: The Era of New TLDs this Wednesday Aug 3 2011 at Herrick, Feinstein LLC in NYC. A special discount code allowing 50% off the normal admission of $60 is offered to ISOC-NY members and guests. Webcast: No live webcast. Will be taped.